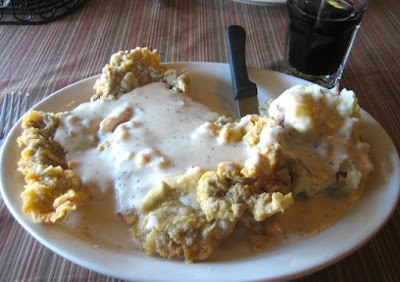 I love chicken fried steak smothered in cream gravy and I just about order it from any menu that features it. It's one of the things that keep me from going vegetarian. I don't know if I can give it up. I mean, I don't eat it all the time but I sure enjoy it when I do, especially if it's served with mashed potatoes. We headed over to Cafe 131 on Friday night and ordered its version called the "country fried ribeye". Laura at Way Out West Austin took the above photo and reviewed it here. I don't know how she had the patience to even take the photo. The steak is handcut, tenderized and cooked while you wait. You can hear the chef pounding the steak way out in the dining room. And the gravy. Oh the gravy is heaven. Creamy, peppery, and full of flavor. My husband had the grilled ribeye which was also amazing.